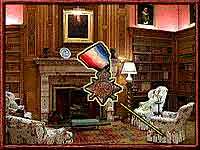 Armchair Travel have produced several games published on CD-ROM and the internet, including our award-winning, educational game: Foul Play - Mystery at Awkward Manor. 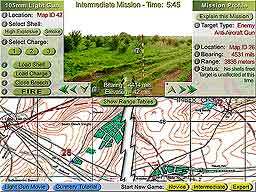 ATC began production of the interactive kiosk-based simulator for the Firepower Museum in 2002. 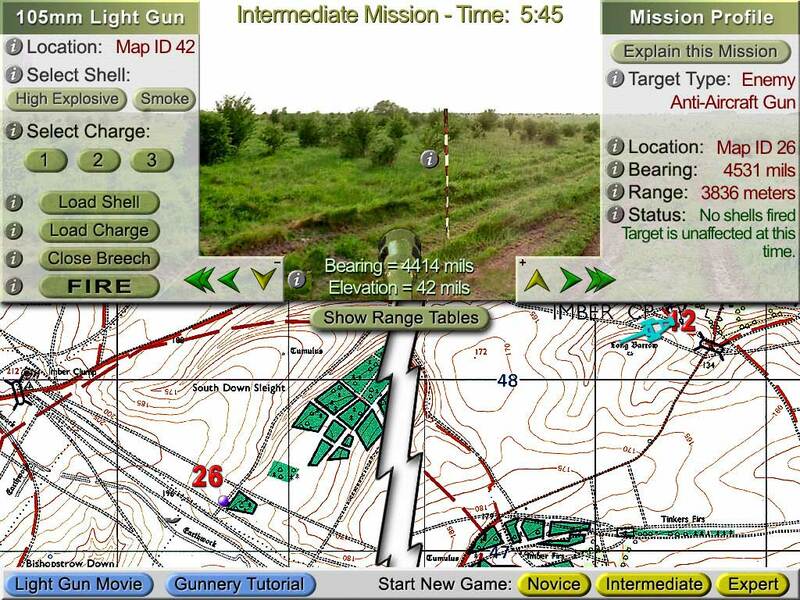 The initial installation in early 2003 has been well-received, and an upgrade to a two-kiosk, competitive system is now planned.The simulator "kiosk" uses video to show you how to load, aim and fire the gun, and then offers a chance to fire at real targets against the clock. 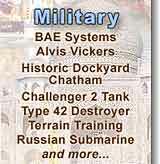 The programme includes extensive video footage of this exceptional gun in action. developed under license from Hasbro, Inc.
With 4,700 different solutions, every game you play is new and exciting! 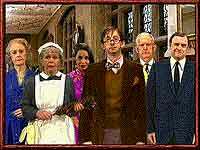 In this game, each player chooses to take the role of one of Sir John's guests. 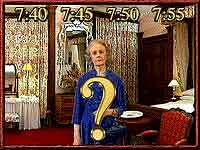 Each player then explores the mansion in turn, searching for clues, and racing against the other players until the mystery is solved. Game turn lengths may be either 1.5, 2.5 or 3.5 minutes each, which allows younger, less experienced players to have longer turns than parents or older players. 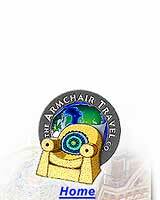 Extensive help screens are also available within the game, and contain information and hints on Virtual Travel ®, searching for clues, deductive reasoning, interviewing suspects, how to win, and more. 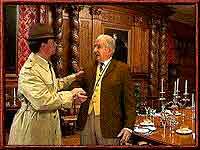 Over 5,000 photos, 65 movies, and 2,000 sound bites have been combined to create a Virtual Travel® murder mystery environment including 39 fully-interactive, photo-quality panoramas and over 2,000 possible clue locations! There are ten game levels available, with levels 1 - 3 containing built-in help and tutorials, and taking 15 - 20 minutes each to solve. Level 4 - 9 games take 35 - 45 minutes to solve. Level 10 games usually take an hour or more to solve. THANKS! We have been pleased by the enormous response to Foul Play from Math and Science Teachers (and parents) wishing to teach deductive reasoning in a novel way! Thanks for your letters and your support; we love to hear from you! To order Foul Play now, please contact us. Note: Images shown below are reduced-size. Clues which you can use to solve the mystery! You and your friends have searched the mansion for a while, and now you're in the Library. There are over a hundred possible clue locations here... Let's see... The table, the mantle, the fireplace, the bookcase, the chair... Yes! Under that chair! Major Gallop's medal. It looks as if Major Gallop was here before dinner tonight! Look around this room and see what else you can find. 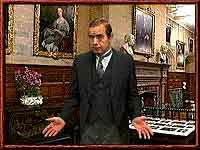 Nothing in the fireplace, on the bed, under that dresser, above the wardrobe... Yes! Above the wardrobe you find the Scissors! And they ARE the murder weapon! Check your notes (A good detective always keeps good notes!). Hmm... The time must have been... And, yes, the location could only have been... Okay! You've got it! Time to make an accusation! 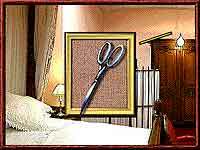 The murder room was the Dining Room, the time of the murder was 7:40, the weapon was the Scissors and the murderer was... Major Gallop! Call the police and... Sergeant Plod arrives to take him away! Should you move on to a more challenging game? Of course! With over 4,700 possible solutions, and ten game levels, all your family and friends can play again and again!